Interviewing for jobs shouldn’t be hard, right? You’ve got the right skills, education and experience, but you’re not getting any offers. This is what I call a disconnect. Somewhere, during the interview process there is a breakdown in communication where you’re sending the wrong signals to your interviewer. It could be your verbal communication, non-verbal, first impression, or your experience. It could be anything and this is why you’re not getting job offers. And that’s why I want to introduce you to the Interview Success Blueprint. Let's face it! You’re stuck in your job search, and the worst part is, you probably don’t know why. But I think I can help you uncover what’s been holding you back. Before you look at the program agenda below, make sure you watch my short video above to learn how the Interview Success Blueprint can help you succeed. "Your tools helped so much. Thank you again for all the help you gave my husband. He worked for the oil and gas industry and had to go through numerous interviews. I would recommend your product to absolutely anybody. Dusty R. Laramie, WY"
"Your program is second to none! This is the best program I have ever seen.After reading your guide, I said oh my God, my answers were wrong in my previous interview. It's no wonder I did not get that job. Thanks, Anis Khan Ashburn, VA"
"Absolutely the best program! I feel absolutely blessed that I stumbled upon your site and had the good fortune of ordering your program because it changed everything. I would recommend this program to anybody." James N. Vashon, WA"
Here's Everything You Are Getting Today! You get ALL 8 video modules - 82 minutes of pure training and coaching from Don – accessible from your online members area. You get BOTH the Interview Success Blueprint Mindmap and Accelerated Interview Method eBooks. I guarantee you will have a huge realization and look at job interviewing with a whole new attitude and perspective. You'll learn how to re-focus your candidacy with laser precision and position yourself for any job you set your sights on. You get a 30-Day total satisfaction guarantee. But I’m so confident you are going to love this program because it’s going to help you develop a road map and strategy while positioning you to get hired for the job you want. If you use the Interview Success Blueprint and somehow don’t get the job you want within 120 days, I’ll give you an immediate 100% refund no questions asked. You see, I’m so sure of the results this program will bring to you — I am willing to put the entire risk on my shoulders. Test it out for yourself. Try the Interview Success Blueprint to build your interview strategy. Once you have, I’m confident you’ll be on the right path to landing your dream job. This is the SAME mindmap and blueprint strategy I use in my $3000 private coaching program. When you watch and study ALL of the material in this program, it will be like I'm there with you, personally, coaching you every step of the way. 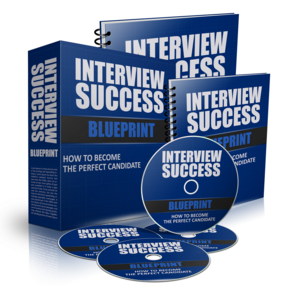 I guarantee you are going to find the Interview Success Blueprint to be one of the most informative, enlightening, and pure helpful job interview training programs you have ever seen. It’s one of the best programs I've created and you can watch it at your convenience, as many times as you want. If you're struggling in your job search, and you can't figure out why. If you're sending out resumes and not hearing back. ...and how to fix everything so you can effectively target any job you want. Let's face it, we can't get every job we interview for, right? But when you're confident in your abilities and positive that you're doing everything RIGHT, you'll feel better about the jobs you don't get. But the reality is... When you do everything right, you're much more likely to get hired for the next job that comes your way. Try the Interview Success Blueprint today. I know you'll love it. PS - The Interview Success Blueprint is like no other program I've created. It's truly a unique approach to making sure all aspects of your job search are in perfect alignment. You could even consider it a check-up from the neck up because it has more to do with your confidence and false perception of interviewing. I've secretly tested the videos from this program on YouTube, and every one of them was met with glowing reviews. Many just considered it one of the very best videos, ever, on job interviewing. Others said it should be a prerequisite for anyone entering the job market. No guide, no website, no resume expert will ever share what I’m about to share with you in the Interview Success Blueprint workshop. This is truly a deep dive into all aspects of interviewing and the #1 reason why employers hire certain people over others. With all my products, you have my personal guarantee that you have never seen nor heard about most of the strategies and concepts I’m going to share with you or I’ll give you your money back. Grab the Interview Success Blueprint today during this special promotional offer, before the prices goes back up.